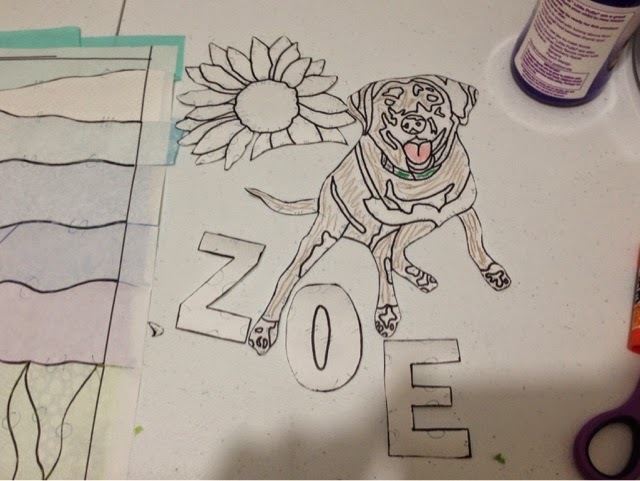 Zoe, an art quilt. Day three progress. See how it started, view day one and day two. Usually when I post progress pictures I only post one or two along with the finished quilt. This is the first time I'm sharing progress in real time. After placing the flower back I could see where it was supposed to go, that was lucky. Do you see it? This is all I managed yesterday. The background is finished. Someone had asked in a Facebook group if this was being pieced on a background fabric? 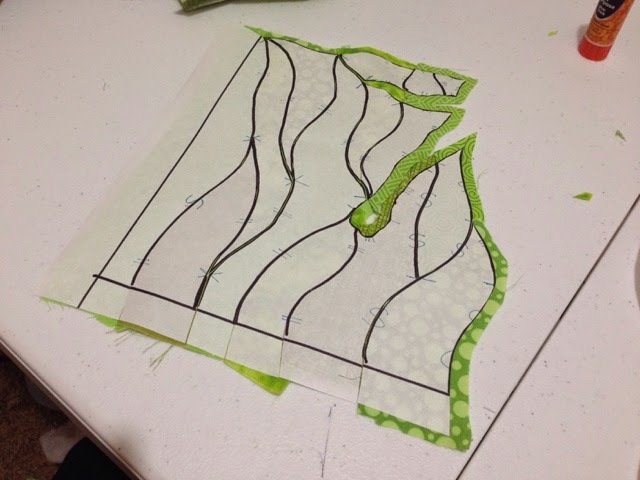 It's not, there is no background fabric other than what I have pieced together below. This is all I have left to do! I will do the name first, then the sunflower and finally Zoe. Zoe will be the most difficult because she has the smallest pieces, but I do know it's possible because there were sooo many small pieces on my son in Getting Along. 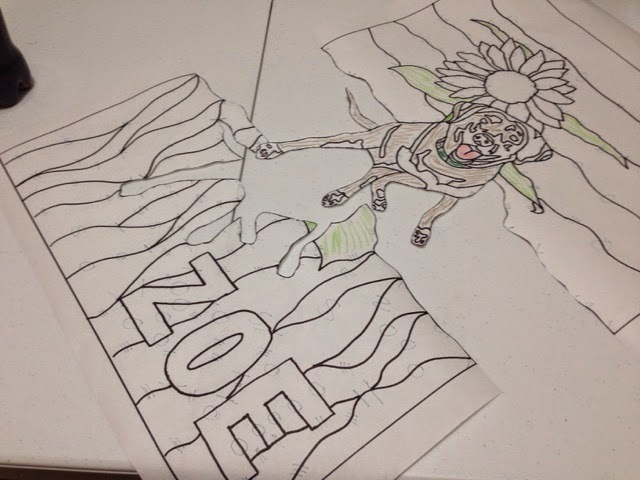 Zoe, an art quilt. Work in progress, day two! 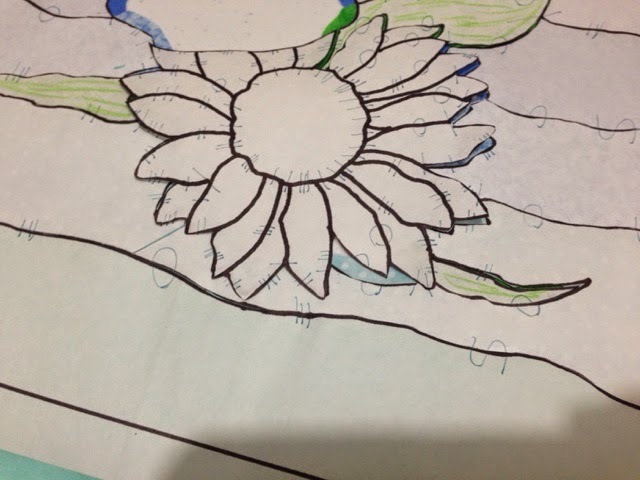 If you missed it, you can see how I started this quilt here. 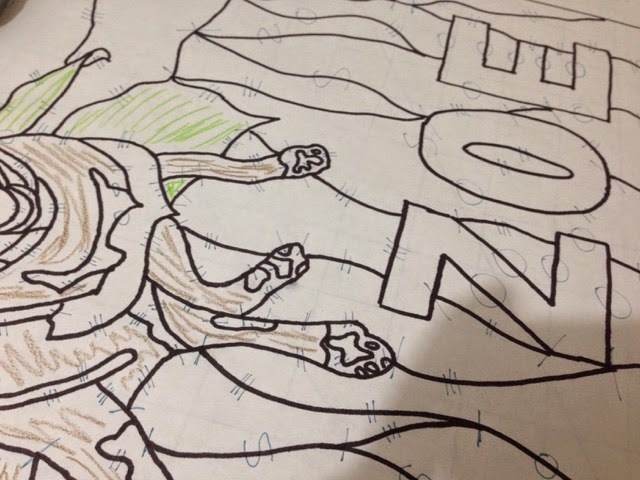 After printing my line drawing poster sized I traced it onto a layer of freezer paper with a Sharpie. 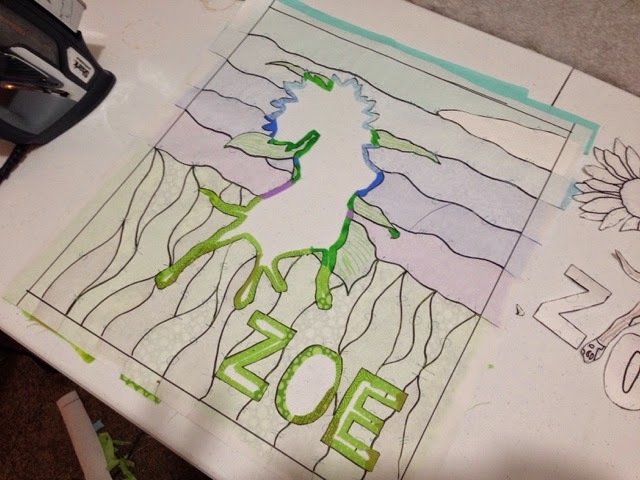 Then I went ahead and added some background lines and Zoe's name. I didn't color the entire thing but I did color some of the pieces that I knew I might not recognize for what they are later on. 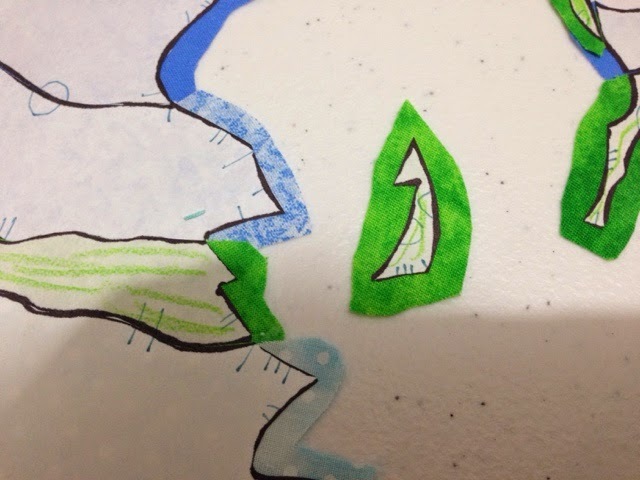 Here is a close up of my... piecing lines I guess you can call them. They will help me later to keep everything where it's supposed to be. I always go overboard with these lines and add way too many... oh well. This is almost always how I begin. Zoe is the main focus so I will piece her last. I find a line and start cutting the ground out, as you can see. So I will piece that, then cut her out of the sky and piece that, and last I will piece Zoe. This is as far as I got yesterday. I didn't spend a whole lot of time on it. I am hoping to spend a lot of time on it this weekend when there is less going on around here. I really need to get this finished before mid-June since we are making a trip down to Mass to visit, I'd love to be able to give this to Melissa then. 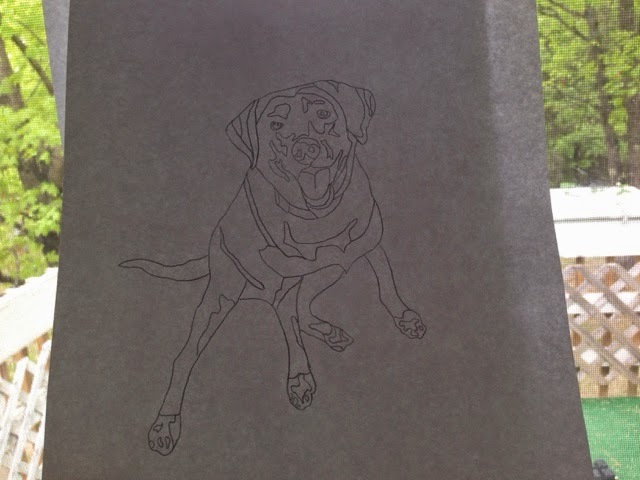 I have never had such a hard time with a tracing before. 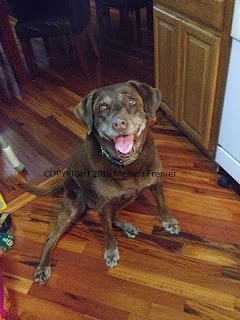 Zoe is chocolate colored and in the photo she is sitting on new wood flooring, so no matter how many times I adjusted the contrast and lighting in black and white (six black and white prints...ugh) it just wasn't working. In black and white she just blended right into the floor around her. So I finally printed a color copy on printer paper, which also didn't work great. But I did use a Sharpie (fine point) to trace directly on that hoping that the Sharpie would show through when I taped it to the window, which it did, finally! 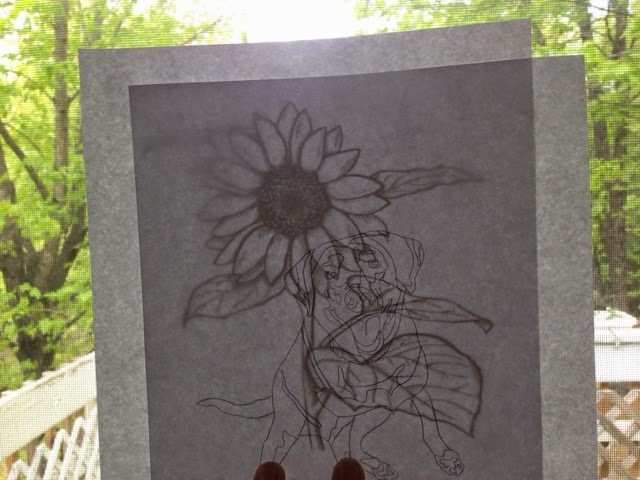 Once that was finished I printed a sunflower clipart I found online. 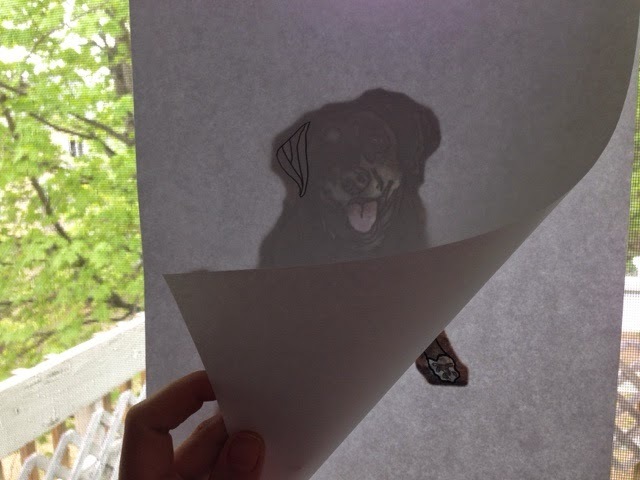 Then I taped that to the window and taped my line drawing of Zoe on top and moved her around a bit until I had her where I wanted her. 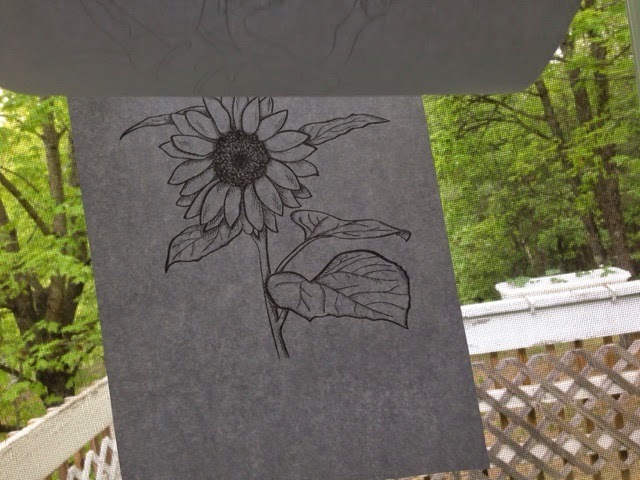 I traced the sunflower onto the same page as my Zoe line drawing, then scanned this into my computer as a PDF file. 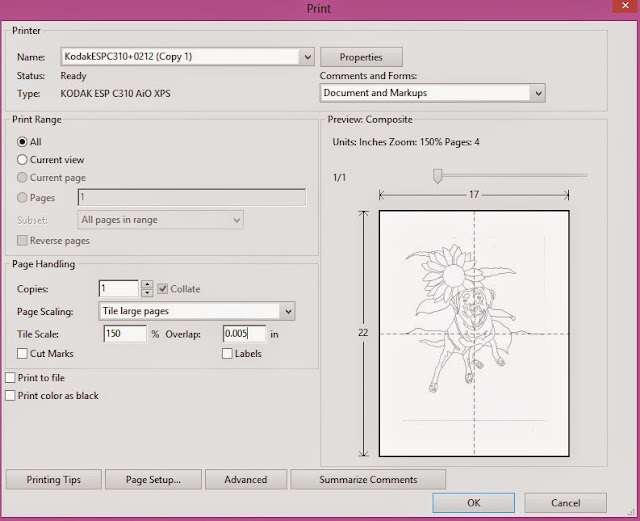 I don't know if you know this, but when you print a PDF file you can adjust the size of what you are printing. Instead of printing to a single page, I have changed my page scaling to 'tile all pages' and my 'tile scale' to 150%. You can play with this number and see the preview to the right to get an idea of the size you are going to get. 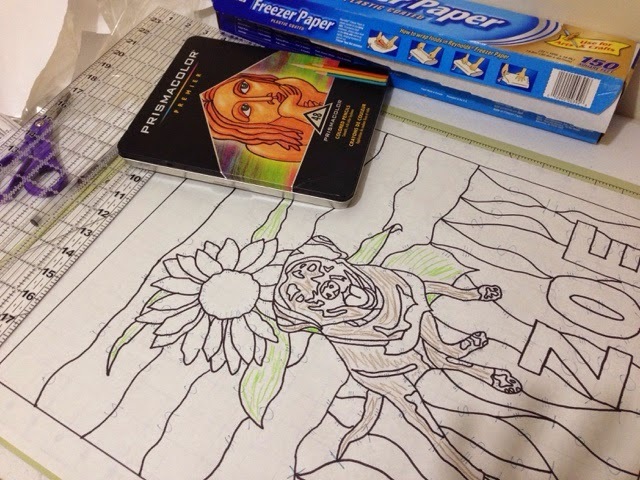 This is the same technique I have used for all of my art quilts including Getting Along which started as a trace of an 8" x 10" black and white inkjet printed photo yet my finished quilt is 31" x 24". Well that's as far as I've made it so far today. I will try to update with progress shots as I can. Just a couple of totes and some stuff for sale. The end of the school year is fast approaching so I thought I better get started on the kids' teacher appreciation gifts. Like last year, I started with a couple of tote bags. The free pattern and video instructions for these are part of Bag Making Basics. What I did differently from the class was I boxed my corners. Not only that, but I boxed them together using a technique I saw on YouTube where you box the lining and exterior together, so you are sewing two lines total instead of four. And this was great because your lining becomes attached to the bottom of the bag, instead of just being attached at the top. I think this is how I will box bag corners from now on. I also added each teacher's initial. Just to do something different, so the bags are identical but not identical at the same time. Yesterday I listed some fabric scrap bags for sale, as well as a ton of Close to my Heart clear stamp sets. As soon as I hit publish here I will be adding more stamp sets for those of you that scrapbook and stamp. I just don't scrapbook anymore so it's time to clear some space. The stamps are very reasonably priced and shipping is pretty cheap. I am trying really hard to stick to my goal of finishing projects I have already started. And while I did venture from that goal and make some candle mats, for the most part I have stuck to my goal. These candle mats were new projects (tsk tsk). These dresdan plates I had orginally planned to use to make a table runner, but to get them finished I decided to just turn them into three candle mats. I made the plates back in March 2014. And now in May 2015 I can finally cross these off my list. Here is a little project I started in July 2013. 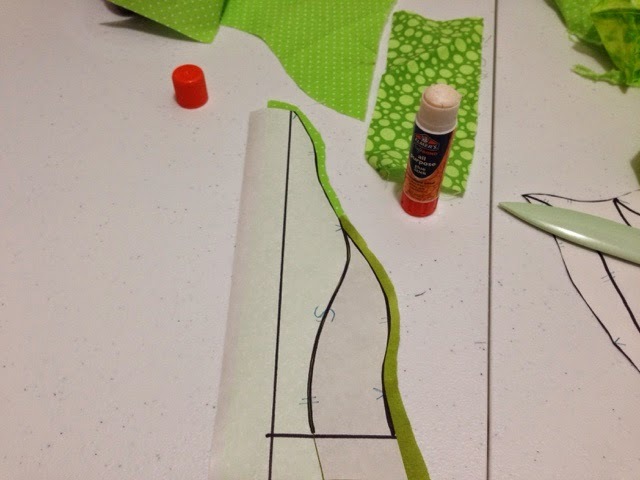 I had seen this pattern in a magazine and wanted to try it using scraps I had acquired. Well I pieced it and then it sat for almost two years, but I can now cross this off my list. I added hanging pockets so it can be hung too, but it can also be a table mat. The last thing I managed to finish is a test block from my Cross Here Quilt Pattern. I just quilted it, threw on some hanging pockets and called it done. I think it's cute even though it's just one block and not a whole quilt. I had fun quilting it. So I think I now have only three unfinished projects left. Once I finish those I can start something new again though I'm not entirely sure what. Sew Mama Sew Giveaway Day Winner. I have already received her email and she has made her choices. And because her birthday was Saturday I threw an extra pattern in there for her. Most people think if they like a page on Facebook they will get updates whenever that page makes a post, whether it's a link, a share, a photo, etc. I don't think a lot of people realize that even though the pages you like are posting, you aren't seeing all of their posts, and sometimes you aren't see any of the posts at all. This is very frustrating for me. Not just because I follow a lot of sewing and quilting pages, but because I also follow a lot of news sites. You would think as these are such popular pages I would get all of the updates but I don't. I don't even get all the local news updates, nor do I see all of the Weather Channel's updates, I also miss out on Recall Alerts, these are things that are important to me. So I thought I would share how you can make sure you see the updates from the pages you like. When you log into Facebook there is a column on the left side. Just find the PAGES section in that column and click on the PAGES FEED link. There you will find all of your page updates. If I didn't check this link every day I would be missing a ton of news, weather updates, quilting updates, giveaways and more. It is very frustrating that Facebook does this. 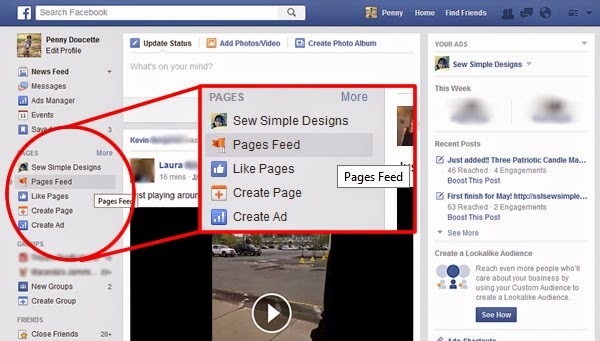 You may also find that on your news feed you keep seeing old updates from friends and family as well. This is because Facebook defaults to "TOP POSTS". Also incredibly frustrating. This is an easy fix as well. Also in the left hand column, this time directly under your name and photo there is a link called NEWS FEED with a little drop down arrow. Click on this link and choose to see "MOST RECENT". Note that you will have to do both of these every time you log into Facebook because it always defaults to TOP STORIES and often hides your page feeds. How I Spent my Mother's Day. I did some laundry, spent some time with the kids. My husband is off at a friend's house learning how to build an adirdondack chair, he's supposed to be building two for the deck. Later we are going out for dinner. I wish I could say I spent the whole day sewing but I didn't. I did however manage to get some sewing done in between loads of laundry and whipped up three patriotic candle mats. I think they're cute. I made these using the periwinkle template I wrote about in this tutorial. I hope everyone is having a wonderful Mother's Day. We definitely deserve it! Don't forget to enter the giveaway for your choice of four of my sewing and/or quilting patterns. Giveaway ends at midnight tonight. It seems like this quilt took days and days and days, but the reality is that it only took about 9 hours. I only get about an hour or two a day to quilt so that's why it felt like it took forever. I downloaded an app on my phone called Task Timer and timed the whole process, which I have never done before, and I was surprised to find this quilt took 9 hours, start to finish and 2 hours of that time was spent hand sewing on the binding and hanging sleeve. #ad Celebrate Mom this weekend and shop Craftsy’s Make It Great event to get up to $20 off ALL online classes. Craftsy classes make the perfect Mother's Day gift, and they also make the perfect gift for yourself. Hurry, offer ends 5/11! Shop now and make your next project great!! I had a lot of fun quilting this. At first I wasn't sure how to quilt it and I used this app on my iPad where I could upload a photo of the quilt and then doodle on it. So that is how I choose which designs to use, although I added stuff in the center block that I hadn't doodled and removed stuff from the lilac sections which I had doodled. You can find the pattern for this quilt on Craftsy. It finishes at 43" square but after washing and drying mine measures 41" square. I added a hanging sleeve, so this can be a modern baby quilt, or a wall hanging, or even a table topper. There is no instruction for the hanging sleeve in the pattern though. Today is giveaway day over at Sew Mama Sew and I have decided to participate. I am offering the winner their choice of four of my sewing/quilting patterns. All of my patterns are in PDF format and I'm always happy to reply to emails if someone gets stuck with a pattern. The winner can view all my patterns here. Cross Here: three block and quilt sizes in one pattern! Pocket Pals. My daughter absolutely loves hers. Gillian Goes 'Round. Because my daughter Gillian designed it. To enter, use Rafflecopter below. You can choose to do any or all of the options below. The only mandatory option is to leave a comment answering the question in Rafflecopter. Giveaway runs from May 6th thru May 10th. Winner will be notified via email by May 13th and will have 48 hours to reply. If winner does not respond within 48 hours another winner will be chosen. You're not done yet!! Head over to Sew Mama Sew for other giveaways! Good luck everybody! !